NORMAN, Okla. (AP) — Kyler Murray passed for 352 yards and three touchdowns and ran for another score to help No. 8 Oklahoma beat Kansas State 51-14 on Saturday. The Sooners (7-1, 4-1 Big 12) rolled up a season-high 702 total yards and only punted once, and that was in the fourth quarter after Murray was done for the day. CeeDee Lamb caught four passes for a career-high 160 yards and two touchdowns, and Kennedy Brooks ran for 94 yards and two scores. The Sooners won their second straight since losing to Texas. 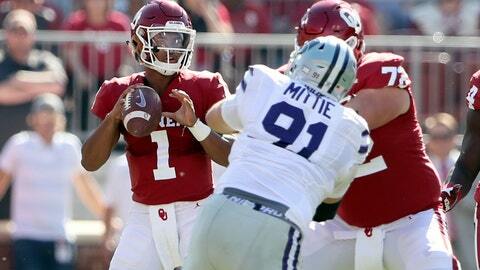 Oklahoma held Kansas State (3-4, 1-4) to 245 yards. Alex Barnes, who entered the game as the Big 12’s leading rusher, was limited to 28 yards on 13 carries. Oklahoma: The Sooners put together their second consecutive solid defensive performance under interim defensive coordinator Ruffin McNeill. The Sooners held TCU to three points in the second half of a 52-27 win last Saturday, then held Kansas State to seven points through three quarters. Oklahoma plays at Texas Tech on Saturday. Both Tech and Oklahoma have one conference loss.